Our product range includes a wide range of polymer based tile joint filler. Polymer Based Tile Joint Filler is a Cementitious mortar adhesive composed of hydraulic blinders added special additives. It is supplied as a dry powder ready to use on site. Grout is ideal for ceramic tiles, marbles, available in one kg pack, applied in a thickness of 2 to 4mm for wall tiles and 4 to 8mm for floor tiles. 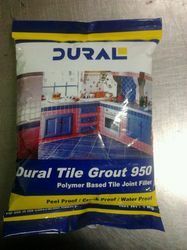 It is also called Dural Tile Grout 950. Looking for Polymer Based Tile Joint Filler ?